Tonight on the History Channel VIKINGS continues with another episode called, “Blood Eagle.” Ragnar and King Horik clash over how to punish Jarl Borg. Meanwhile, Ecbert eyes a new alliance. On last week’s episode Ragnar received an unexpected offer from King Horik and Lagertha’s new husband didn’t seem overly pleased to see her. Meanwhile, Athelstan becomes King Ecbert’s trusted aide. Did you watch last week’s episode? We did and we have a full and detailed recap, right here. On tonight’s episode Ragnar and King Horik clash over how to dispense justice to Jarl Borg. In Wessex, King Aelle arrives and Ecbert has an eye on a new alliance. Tonight’s episode looks like it is going to be great and you won’t want to miss it, so be sure to tune in for our live coverage of The History Channel “Vikings” at 10:00 PM EST! While you wait for our recap hit the comments and let us know how excited you are for the season 2 episode 6 of Vikings tonight. Tonight’s episode of Vikings begins with King Horik and Ragnar. Horik asks him if he is going to proceed with Jarl Borg’s execution, Ragnar confirms he is. Horik advises he does it low-key, or else no one will want to form an alliance with him. Meanwhile a King and his daughter arrive via wagon in King Ecbert’s village. The new king announces he has come to create an alliance with Ecbert so that they can save England together. Floki’s girlfriend announces that she is pregnant, he wants them to get married so that the Gods will bless them. He doesn’t want Ragnar present, Ragnar gets everything and he doesn’t him to have them. Bjorn wants to know why Ragnar doesn’t trust him and didn’t tell him that he was going to take Jarl Borg captive. Ragnar says that he couldn’t find him that night. Bjorn confesses he was with a girl. Ragnar tells him he needs to think with his head and not his heart. King Horik pays Jarl Borg a visit in his cell, he confesses to Jarl Borg he doesn’t want to see him suffer. He brought Jarl Borg his dead wife’s skull that he used to carry everywhere with him. Ragnar visits a wise man and asks him where Athelstan is. He tells Ragnar he is with someone he knows, a wealthy man, a king. Rollo is pressuring Ragnar, he wants to know why they haven’t executed Jarl Borg yet. Ragnar says Horik wants him to wait, Rollo is annoyed that he is taking order from Horik. Ragnar watches form the shadows as Princess Aslaug speaks to Floki’s girlfriend and then runs to Horik and tells him that Floki is mad at Ragnar. Horik doesn’t buy it, he says that Floki loves Ragnar. King Ecbert and King Aello sit down to discuss their potential alliance and Ragnar and Horik. Ecbert says it suits neither or them to have an unstable neighbor. Ecbert wants to join forces with Aello and conquer Mercia and divide the country up into parts and split it. Ecbert wants his nephew to marry Aello’s daughter Judith to ensure they remain loyal to each other. Aello agrees. They waste no time and the next day Judith marries Ecbert’s son Ethelwulf. 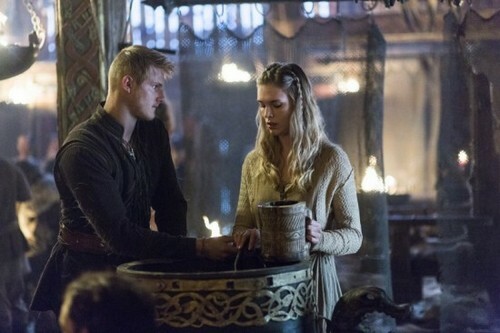 Meanwhile back in Mercia Floki is marrying his pregnant girlfriend Helga. A messenger arrives and tells Rollo he needs to speak to Ragnar. Rollo brings the messenger to Ragnar. The messenger announces he has come on behalf of Earl Engstad and the Earl has fleets of men and wishes to form an alliance with Ragnar to help him attack Wessex. Ragnar tells the messenger he wants to meet the Earl, and tells him to bring him back for a meeting. Horik visits Jarl Bork in his cell and tells him that he plans to set him free. Horik reveals to Jarl Borg that after he sets him free they are going to kill Ragnar. Ragnar is taking a bath, and talking to Bjorn, one of his men barge in and say that Earl Engstad had arrived. He is in the woods waiting for him. Ragnar heads into the woods and realizes that Earl Engstad is none other than his ex-wife Lagertha. She reveals she is an Earl now, and she has four ships and over 100 warriors. Ragnar says that if she is still the “Lagertha he remembers” then he will form an alliance with her. Bjorn sneaks in to Jarl Borg’s cell and brings him some food. He watches as Jarl Borg inhales the food. Princess Aslaug asks Ragnar what he thinks of the Earl of Engstad. Ragnar says he thinks the Gods are playing a joke on him. Princess Aslaug says she likes Lagertha and she envies her. It’s time for Jarl Borg’s execution, apparently Horik won’t be helping him escape. He marches up on a platform in front of the entire village. He drops to his knees in silence while Ragnar slices his back open and pulls his ribs off from his spine one at a time just like he told Bjorn he planned to do and then he pulled his lungs out and placed them on his shoulders and waited for him to die.